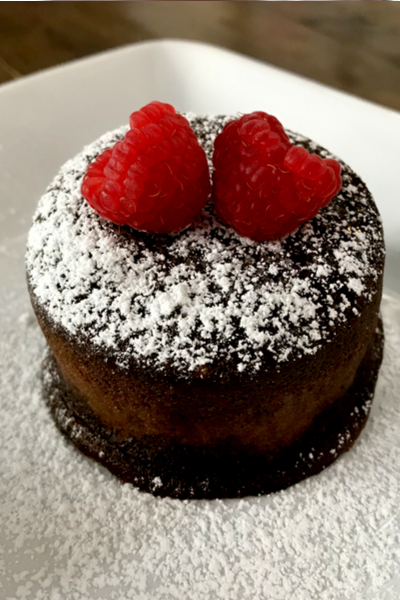 When it comes to dessert, there isn’t a better one than Instant Pot Lava Cakes. Well, of course, if that is if you like chocolate. I had my first molten lava cake at a restaurant many years ago. I swore I died and went to heaven. 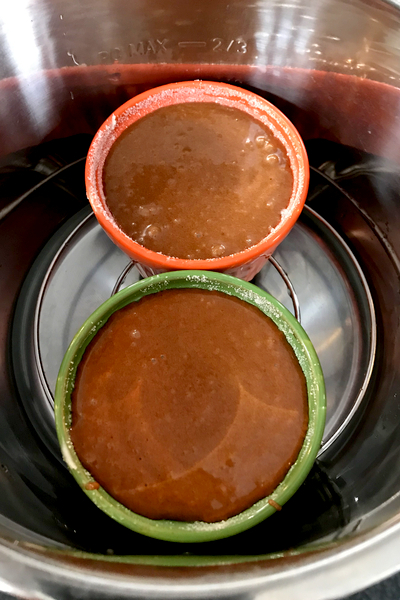 Instant Pot Lava Cake for two! And the funny part is, I am not a lover of chocolate. In fact, if you give me an option between chocolate and cheesecake, I would choose cheesecake every time. And if you told me that I could only have chocolate cake or ice cream, not both, I would be scooping out ice cream in minutes. However, that all changed when we were out for New Year’s Eve dinner several years ago. It was a kind of dinner that the menu was already planned for you. There was no ordering off a specific menu. They provided you with a 6 course meal and you either ate it or you didn’t. No need for a mixer, a whisk will work just fine to make the batter. When it came to dessert, I was so full that I didn’t even consider taking a bite of whatever they brought out to me. That was until I put my eyes on this round mound of what appeared to be an individual chocolate cake. It was sprinkled with powdered sugar and had a couple of raspberries on top. Not wanting to be rude, I took a bite of the sweetened raspberries, thinking that would be enough. I had no idea I was about to sink my teeth into a soft sponge-like cake that was filled with liquid chocolate. This lava cake only uses 3 tablespoons of flour. 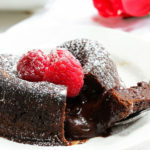 Lava cake is a combination of a flourless chocolate cake and a souffle. It gets it’s name for the liquid center that spills out like lava when the cake is opened up. 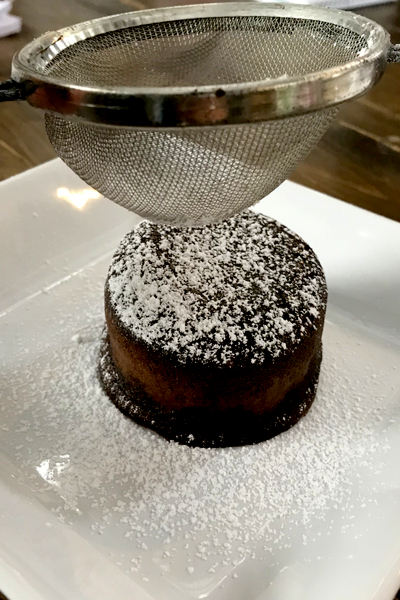 The chocolate fondant pours out from the inside of the individualized round cake, making for a dramatic dessert appearance. It makes for the perfect dessert for two people. Well, that is if you want to share. Fill the ramekins with the batter up to 1/4 inch of the rim and place on the trivet. 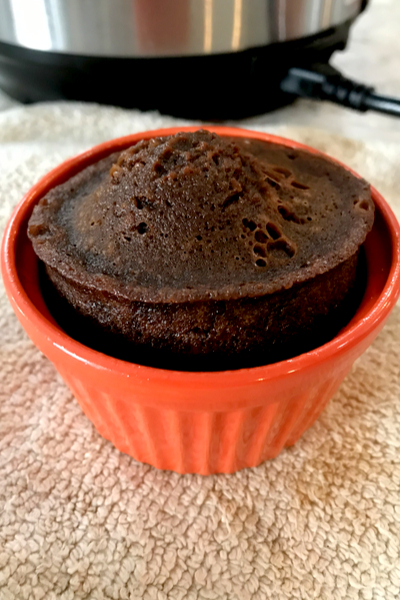 So when I began experimenting with desserts using my Instant Pot, I knew that Instant Pot Lava Cake would have to be on the menu at some point. My first attempt at dessert in my Instant Pot 6 quart duo was my Oreo Cheesecake recipe. It was absolutely delicious! And I have made several other cheesecakes since then. But when it came to asking my husband what dessert he would like for Valentine’s Day, he gave me the open ended answer of ‘something chocolate’. I first thought about taking the easy road and making Chocolate Covered Strawberries. But then I remembered how I fell in love with lava cakes. Once the cake is cooked, immediately release the pressure and let it rest for 5 minutes. 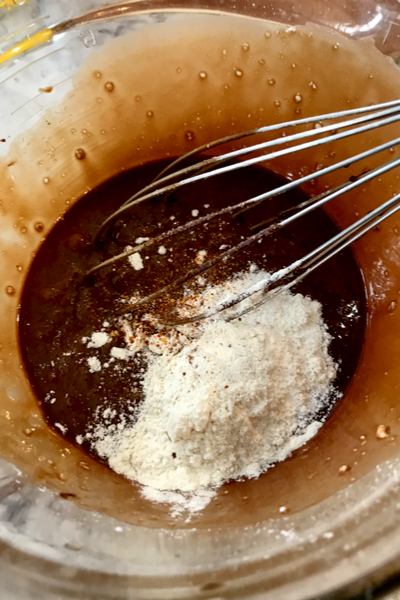 And since I was experimenting with my Instant Pot recipes, I knew that it couldn’t just be any lava cake. 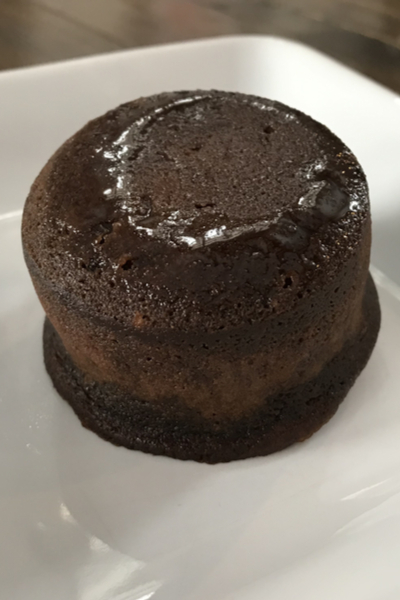 It had to be Instant Pot Lava Cake! Because I was only making the lava cakes for the two of us, I pulled out my Instant Pot 3 quart mini to do the job. You can of course make this recipe in a 6 quart or even the 8 quart Instant Pot as well. The only difference is that it might take longer to come to pressure. The size of your ramekins will make a difference on the cooking time required in the Instant Pot. The lava cake will easily invert to a plate for immediate eating. I used 4 ounce ramekins for this recipe. If you have bigger ramekins, you will need to increase the cook time accordingly. I would start by increasing in one minute increments based on the size of the ramekin that you are using. And be sure to perform a quick release of pressure as soon as the cooking time expires. Add a little sifted powdered sugar and raspberries to make a spectacular dessert for two! This is one recipe that you don’t want to allow for extra time under pressure so that you get nice gooey chocolate center. Mini chocolate cakes filled with gooey chocolate that is perfect dessert for two. Grease the inside of two 4 ounce ramekins with the softened butter. Sprinkle 1 teaspoon sugar into each ramekin and rotate it around so that the entire ramekin is coated with sugar. Set aside. Melt butter and chocolate chips in microwave safe dish in the microwave on 50% power for 1-2 minutes or in a double broiler. Stir until melted and well incorporated. 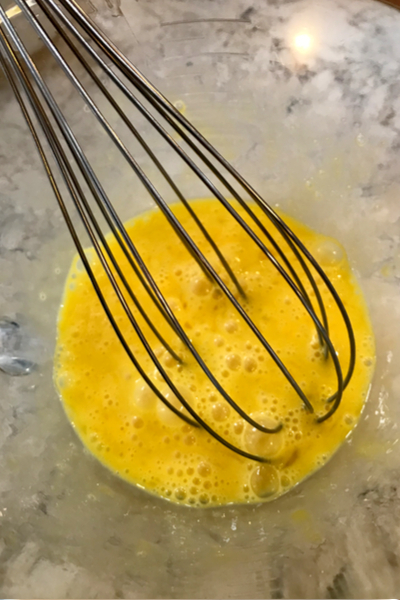 In a medium bowl whisk eggs and egg yolk. Add the vanilla and melted butter and chocolate mixture to the bowl. Mix well. Add powdered sugar, flour, salt and cayenne pepper. Mix until well incorporated. Pour batter evenly into prepared ramekin. Pour ¾ cup water and the trivet in the liner of the Instant Pot. Set ramekins side by side on trivet. Secure lid with the valve in the sealing position. Pressure cook/Manual on HIGH for 9 minutes. When cooking time expires perform a quick pressure release (QPR) and turn Instant Pot off. Carefully remove the lid and using oven mitts, take the ramekins out of the Instant Pot. Allow the ramekins to sit for 5 minutes. Loosen the lava cake by running a small knife along the inside of the ramekins. Place a small plate over a ramekin and invert so the lava cake comes out and sits upside down on the plate. Repeat for the other lava cake. Optional: top with sifted powdered sugar, raspberries and a sprig of mint. This recipe was tested in 4 ounce ramekins. Increase time if your ramekins are larger. This recipe makes enough batter for 3 servings. Because of the quick cook time, we made them in 2 batches.